To the vast majority of handgun aficionados, the words ".45 ACP" and "M1911" are practically synonymous. In fact, some of ol' slab-sides' more ardent partisans believe that chambering this iconic pistol in any other caliber verges upon heresy if not outright treason. But the fact remains that while the M1911 was originally chambered for the .45 ACP, other chamberings were quick to follow, and Smith & Wesson recently introduced what may be one of the most attractive 9mm 1911s on the market today: the SW1911 9mm Pro. It is a full-size 1911 built on a stainless steel slide, frame and barrel. When I first picked up the pistol, I was impressed with its excellent balance and above-average ergonomics. A closer inspection revealed a faultless finish and, unlike some of the near-milspec 1911s out there, there was not a single rattle, slap, bang or clank when I shook the Pro--evidence of tight tolerances and attention to fitting. The slide features sculptured sides, which not only provide a distinctive look but reduce weight. The rear is fitted with a Novak low-mount combat sight while the front is dovetailed to accept a blade, both units having white dots to speed up alignment. The external extractor features a massive claw for pulling even the most recalcitrant spent case from the chamber and discarding it out of the lowered and flared ejection port. It should be noted that the SW1911 Pro's frame displays many of the features that are normally seen only on custom-built pistols. Metal has been removed from under the trigger guard so you can get a high grip on the pistol, and the frontstrap and mainspring housing both feature 30 lines-per-inch checkering. All this contributes to the gun's excellent handling characteristics. The 9mm Pro comes standard with a full-length guide rod for increased reliability while its five-inch, match-grade barrel has a precision-crowned muzzle for optimum accuracy. Controls consist of ambidextrous thumb safeties, extended slide release, magazine release button and a beavertail grip safety with a palm swell. These not only improve ergonomics and reloading speed but the latter device improves recoil control for fast follow-up shots. 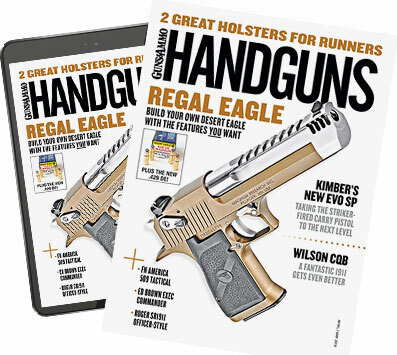 Last, a moderately sized magazine-well funnel lets even the most fumble fingered among us slide those Wilson 10-round magazines in there quickly and smoothly. To see if the 9mm Pro could live up to the family reputation, I headed for the range. After running 20 rounds of each brand through the pistol to check for functioning, I proceeded to see what type of accuracy I could wring out of it at 25 yards. The first round of Hornady Critical Defense I launched downrange obliterated the little "10" inside the 10 ring, and the next four rounds clustered tightly around it. Of the 15 groups I fired that afternoon, none of them measured larger than 2.63 inches, and there were several sub-1.5 inch groups. The 9mm Pro's frame is sculpted to reduce weight, and metal has been removed from underneath the trigger guard to permit a high grip. The 9mm Pro has a funneled magazine well for sure insertion of the supplied Wilson 10-round mag. Both the frontstrap and the mainspring housing feature 30 lpi checkering and that, combined with the stippled wood grips, enhances recoil control. After chronographing the test ammo, I belted on a Safariland holster and ran the 9mm Pro through a series of offhand drills at five, 10 and 15 yards. Its excellent ergonomics (hey, it is a 1911 after all) allowed fast, accurate follow-up shots, the extended controls permitted fast, positive manipulation while the strippled grips and checkered grip frame provided a secure purchase for enhanced recoil control. The sights were fast to acquire, quick to align and allowed rapid transitioning between targets, and the magazine-well funnel allowed fast, fumble-free reloading. Of the 25 shots I fired at each target, only two were outside of the A zones. So we have a good-looking, fine-handling pistol, but some readers might wonder what it would be good for. Lots of things, I think. It would be a perfect choice for IDPA's Enhanced Service Pistol division and for steel matches where all you need to do is ring a target. It would be great for law enforcement officers who carry a single-action auto, and thanks to its flat cross section it would make a good concealed carry gun as well. Naturally, it would also make a fine home defense handgun. Do you need anymore reasons or excuses to buy one? I know I wouldn't. All in all I found the 9mm Pro a shootable--and practical--version of this classic handgun design. Could I suggest any changes and/or additions? Well, only one: an arched mainspring housing. I find with such an accessory installed I can shoot a 1911 faster and more accurately than with the flat style. But it seems that most of today's 1911 manufacturers aren't listening to me. So what else is new? The 9mm Pro has a lowered and flared ejection port plus a mas­­­sive claw extractor to en­­sure flawless spent-case extraction.